Scotland's first minister has claimed that the UK government's bill to convert EU law into British law is a "naked power grab". The repeal bill will ensure the same rules apply in the UK after Brexit. But Nicola Sturgeon said it was not clear which powers repatriated from Brussels would be handed to the devolved nations. Scottish Secretary David Mundell insisted the bill would result in a powers "bonanza" for Holyrood. He said this could include areas such as environment, criminal justice, consumer rights and energy, which he said "could all in relatively short order come to the Scottish Parliament". He said that separate legislation would be needed to cover areas such as fishing, farming and immigration, and a series of further bills could also require legislative consent from the devolved administrations. And he insisted that the return of powers and responsibilities currently exercised by the EU to the UK was a "transitional arrangement" that would allow for the further onward devolution of powers. In a briefing to journalists, he said: "This is not a power grab, it is a power bonanza for the Scottish Parliament because after this bill has been implemented the Scottish Parliament will have more powers and responsibilities than it has today. "I'm happy to be held to account for that statement once the process has been delivered." But in a joint statement issued by Ms Sturgeon and her Welsh counterpart Carwyn Jones, the two leaders said they could not recommend that legislative consent is given to the Brexit repeal bill as it stands. The statement claimed that the bill was a "naked power grab, an attack on the founding principles of devolution and could destabilise our economies". It added: "The European Union (Withdrawal) Bill does not return powers from the EU to the devolved administrations, as promised. The statement was issued after Ms Sturgeon, Mr Jones and Labour leader Jeremy Corbyn held separate meetings with Michel Barnier, the EU's chief Brexit negotiator, in Brussels. 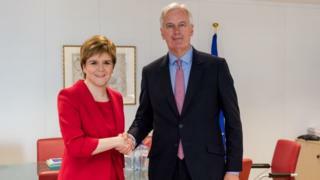 Ms Sturgeon described her 45-minute meeting with Mr Barnier as "useful and constructive", and said she used it to stress the importance of the UK remaining in both the European single market and the customs union. But after her meeting with Mr Barnier, she said: "We have always been clear that this is not about holding separate Scottish negotiations - it is for the UK as the member state to negotiate with the EU - and as such we will continue to work hard to influence the UK position. The meeting was held as Mr Barnier prepares for the second round of talks between the UK and EU, which will begin on Monday. Speaking on Wednesday, Mr Barnier stressed that Brexit negotiations would only be done with the UK government. But he said he had always made clear that he would "listen to different points on view in the British debate". Ms Sturgeon has previously called for a "short pause" in the Brexit process so consensus can be built across the UK on the best way forward. The first minister wants membership of the European single market and the customs union to be at the heart of the process, but Prime Minister Theresa May has insisted the UK will be leaving both. The UK government has also previously rejected Ms Sturgeon's calls for the Scottish government to be involved in the Brexit talks, and for Scotland to keep its single market membership even if the rest of the UK leaves. It has pledged to "consult" with the UK's devolved administrations during the Brexit process.